In the grand scheme of things it's perhaps not so important which celebrity wedding took place here. 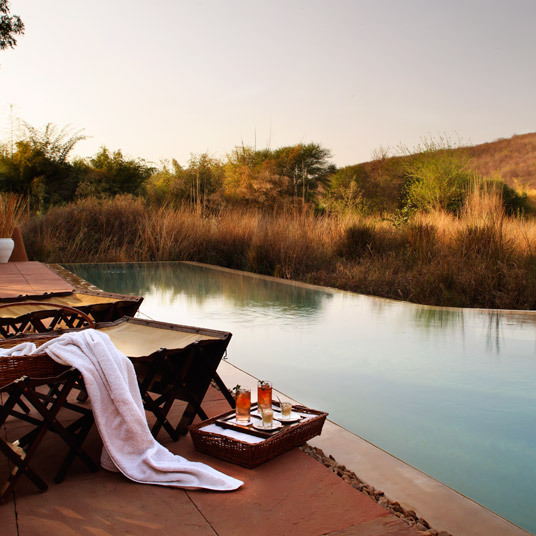 But surely it says something about Sher Bagh, a luxury tented camp adjoining India’s Ranthambhore National Park, that it’s the sort of hotel where a celebrity wedding might conceivably be on the cards in the first place. After all, it was founded by a family of wildlife filmmakers, not luxury hoteliers — it’s apparent, however, that they’ve uncovered a genuine talent for hospitality. Yes, it’s camping, but only technically. Sher Bagh’s twelve tents come with en suite bathrooms and private, covered verandahs — and the semicircular layout of the camp means your neighbors are easy to ignore. What’s not provided in the tent (and it’s a short list) is found in the camp’s central lodge, with its sitting room and cocktail bar, or in the dining tent, for when the weather calls for an indoor meal. It usually doesn’t. More common is dinner around the campfire, perfect for building a bit of late-evening camaraderie, where the day’s stories are shared. With any luck the tiger will feature prominently in the evening’s conversation — safaris, whether by jeep or by horse, are Sher Bagh’s raison d’etre, and while the big cats can’t be counted on for daily appearances, the rest of Ranthambhore’s wildlife are generally good for at least a dinner’s worth of narration.